These are a few of my favorite things. 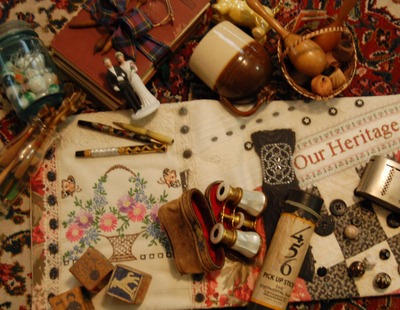 Some antique, others merely vintage ~ gathered from the belongings of our parents and grandparents, they are now sprinkled throughout our home. They evoke precious memories whenever we look at and handle them. What are the triggers that bring back those vivid, full blown recollections of things about which we have not thought in years? What is the role of the five senses in relation to the spontaneous memory that stores up perceptions and impressions and reveals them in sudden flashes, but with great detail ~ as though we were back in the moment experiencing them once again? Somewhere along the way (in college, I imagine) I studied Marcel Proust’s epic novel, Remembrance of Things Past. Proust has been credited with coining the term "involuntary memory" for the concept of human memory in which "cues encountered in everyday life evoke recollections of the past without conscious effort". The most famous instance of involuntary memory in Proust's work is known as the "episode of the madeleine". His vivid description of his own flood of memory when he ate a madeleine teacake, accompanied by a cup of tea, has long fascinated readers of literature and science who have pondered the enigma of the sudden awakening of long dormant memories. While driving home from work the other day I was listening to beautiful classical music on National Public Radio. I suddenly had a full blown memory of attending Houston Symphony Orchestra concerts as a child. I hadn’t thought of those for years, although they are surely an important part of the memories of my childhood and youth. My father was always referred to as a “classically trained vocalist” and some of you may remember hearing him sing solos or in ensembles at Park Place Baptist Church. He had a very rich, expressive baritone voice. At the time I felt somewhat embarrassed by his dramatic interpretation of a song, but I recognize now how talented he was. Randy has some scratchy recordings of Daddy singing, and I can’t begin to tell you how it thrills me to hear his voice in that way, at this time. In my mind’s eye I picture the expression on his face and the gesture of his hands with each phrase of a song. I mention my father’s background in relation to those concerts because he was always looking for ways to expose his kids to fine musical experiences. He had an extensive collection of classical music recordings and although we were quite late in getting a TV, we always had the current state-of–the-art equipment for playing those records. And he often found sources for free tickets to concerts and operatic performances. Sometimes we each took a friend, more often our family of four attended together. I wrote Randy an e-mail asking what he remembered about the concerts, and here is his answer, in part. Randy wrote, “The outdoor concerts in the amphitheater at Hermann Park were performed by the Houston Symphony Orchestra. I believe the city parks and recreation department sponsored them, and they were free to the public as I remember.” We took blankets and picnic food, and sitting there under the stars, listening to that grand music, was quite an experience. As you may know, Randy’s entire career has been built around music and drama in one way or another (choral director in schools and churches, college professor in the field of music, director of numerous community and school related dramatic/musical extravaganzas, actor/vocalist in some). My musical abilities have been used with young children almost exclusively – in schools and in churches. Surely we were greatly influenced in those pursuits by our exposure to fine music by our father. In the center of the photo accompanying this post, you will see some brass and iridescent mother-of-pearl covered opera glasses. Daddy had used these while growing up and in college, and I am sure it gave him great pleasure to share them with his own little ones as he took us to the concerts. While Randy remembers his imaginings of girls, I remember holding and treasuring those opera glasses, zooming in on the various performers. The mechanism still works smoothly after all these years. I still love to hold them fondly, working the wheel that focuses the lens, and doing so is one of the triggers that unlocks the storehouse of my mind. My life is full of beautiful and positive experiences now, but I also find great pleasure and comfort in my own Remembrances of Things Past. What experiences of sudden, full-blown involuntary memories have you had? What sights, sounds, textures, smells, tastes evoke strong, in-the-moment memories for you? Hi Karla, you have a magnificent art with a pen. The relics in your photo ( wooden blocks )do prompt memory. I could sense the feelings you have for every image there. Have you ever attempted writing a book? Thanksgiving Eve: As I sit in my office and supervise the processing of some of the fine examples of the evolutionary process (like the 18yr old, charged with murder of a cab driver) and reflect upon the Thanksgivings of the past. You remember when your mom was up all hours of the night to make sure the turkey was just right. The arrival of friends and relatives, the gigantic amounts of food served and consumed. Of course immediately after the meal it was time for the football game of all football games-the annual clash of Texas A&M and the University of Texas. As I drove in to work tonight, I diverted from the Freeway and drove thru "Downtown". I marveled at the changes that have taken place since we were young, new skyscrapers everywhere. I decided to look for the old Conoco Oil Co. Bldg-remember the "Weather Eye"? Well, the bldg. is still there but the "Weather Eye" is long gone. I can recall sitting in one of our classes at Deady and being able to see the "Weather Eye" from there, now it's hard to see the bldg. from 2 blocks away. Gone also is the original location of "James' Coney Island". So when those of you living out of town come in for the 50th, don't count on the old landmarks. Hi John, correct me if I am wrong as to the prices, but my Mom and Dad would take me and my older brother to " The Metropolitan " for a movie and then to " James Coney Island " for hotdogs and a big " Nehi " before catching the " Lawndale " city bus and head for home. As I recall you could get hotdogs @ 5 for a buck and the " Nehi " was $.05 or $.10. The bus ride was a dime for us youngsters. Am I close to being right? I remember those bus rides from Park Place to downtown Houston and the hot dogs at James Coney Island. I think there was an upstairs part that was a balcony over the main floor. Is that right? Fascinating, these memories! Do you realize we sound like OLD FOLKS?!?!?!?!?! Green light, no change in view. Blinking light, rain is due. And I have trouble remembering my phone number sometimes. Would someone tell me where and what building was downtown and it straddled the road? You could drive through it. Hi Sheila, seems I remember a building that straddled a street downtown but can not for the life of me remember exactly where it was. I know that St. Joe Hosp. had a walk over between buildings but seems there were more than 1 of those. Maybe someone will help us remember. Was the building on the north side of town? I remember a building like that called the M & M Building I think?? Didn't your family have a great old two story home on the Old Galveston Highway? Mike, your hot dog prices are right-on, I think the price for the movie was 9 cents (under 12), and the drinks & popcorn were a nickle. Shelia, the M&M bldg was/is beside the bayou bridge on Main St., it's now UofH Downtown. And Shelia, if I remember correctly, didn't you live on the corner of Broadway & Detroit, or was that someone else? Isn't all this memory searching fun? We lived on Old Galveston Rd. across from Texas Pipe Bending Co.
in a one story red brick house that I think is still there. I did the Google Earth thing to check out the old neighborhoods. Interesting. M & M building it is. Can traffic still go through? I think train tracks went through too. Thanks for the heads up John, I never had to worry about how much tickets cost when I went with my folks but I remember the Saturday fun club at the " Kirby " was $.09, we did that for a while, then we graduated to the Saturday fun club at the " Avalon " on 75th @ Lawndale, we could walk there. It was also $.09 . It began at 9 AM and after a movie, serial and numerous cartoons we would stay for a double feature, news reel and more cartoons. We exited the theatre @ 5 PM and walked down 75th to the " Mason Park " pool for the 6 PM - 10 PM session and swam till closing at which time we would stop at the snack bar for a "Frozen Snicker". WOULD YOU BELIEVE, we did all this on Saturday with our $.35 allowance? Weren't those " The Good Ole Days ? Oh yeah, the Snicker must have cost $.10 because we could opt for a bus ride home or walk and eat our " frozen Snicker " ! ! What fun to listen to (and interact with) all of you!!! All day yesterday and today - whilst going about my duties at work - I have found myself reliving those bus rides to downtown Houston, movies at the ornate Metropolitan/Majestic/Loew's Theatres, Coney Island hot dogs, etc. Sheila, I remember your house and actually saw it a few years ago when traveling out that way due to construction detours. Of course, a lot of light industry has built up in that area, but the house still looks elegant. I thought it was a very special house and remember several parties there. Your mother was a very gracious lady. Since we are reminiscing 'bout the old days and James' Coney Island... I remember when fresh out of the Marines, I was pounding pavement looking for a job and it was close to lunch time. I entered James' and to my amazement there in line was "Silver Dollar" Jim West, one of the founding partners of Humble Oil, handing out a silver dollar to each of the workers in the serving line and he was accompanied by his close friend "Tex" Trammel, founder of the Houston Natural Gas Co. And there I stood counting my coins to see if I could pay for two or three Hot Dogs. Karla – Just happened to notice that your question of Dec. 11th remains unanswered concerning the physical layout of James Coney Island. I won’t discriminate as to which one since there is only one as far as I’m concerned. As you entered a glass front facility, the Coney prep area was on the left side behind a stainless steel see thru work area. Doggy buns were stacked against the wall waiting for human dynamos to slam them down on narrow stainless trays and immediately stuffed in a dog loaded with onions. No concern with gloves, paper, eat in or take out. It was a slam, bam thank you process. By the time you hollered out the number you wanted, yes, no or with chili they were already processed and on an oval plate in the hands of a guy asking if you wanted chips and what to drink. Fifty cents or a dollar later you were eying the old oak right armed school desk along the opposing wall as a place to sit or heading up the stairs to a dining area open to the circus of service, expediency and continuity below. Houston was the nation’s birth place of the covered mall, domed stadium, mono-rail system out by Playland Park, multi block modern apartment units, the Yellow Page cover with Tabby and her kittens and other such critters and I suppose, the term “fast food”. Whether you rode the Park Place, Harrisburg, Shuttle or Lawndale bus into town, they all brought you within a couple blocks of James Coney Island. An adventure to the Majestic Theater, Woolworths and Foleys followed by four fresh bun onion smothered Coneys made for a great Saturday in preparation of dancing the night away at Milby Park. This was one of the greats being raised in Houston during the ‘50’s. What a great description of James Coney Island (your high school English teacher would be so proud of you!). That is exactly the way I remember the place. As you walked us through each turn I could anticipate your next description and BINGO, you confirmed my memory. What a fun experience, reading your post. Wow Bob, you nailed it ! I could not add anything to your colorful desciption of an historical place in OUR TOWNS history ! Ummm, maybe a couple things that were my favorites of all time, being the smell of hot buns and the most delicious chili of our time. One could but enter the front door and begin to taste the memory of the last time you were favored by a visit to the James Brothers establishment ! Oh yeah, I think you were refering to the Teen Canteen which was held at The Mason Park gymnasium, heh . Please correct me if my memory bank is a little off kilter. The cover of the old Yellow Pages was always an exercise in observation to see how many weird and/or comical things the artist had incorporated into the latest cover. One of my favorites was probably one of the last ones. It featured the Astrodome with an assortment of different objects on the parking lot (covered wagons, space ship, cowboys), and as always hidden items in the background (skyline, just whereever he could hide something in plain view). Maybe if "Ma Bell" brought those covers back they might generate a little more interest in "Our Town". Anyone have one of those old covers? Pull up the following link concerning the Yellow Pages cover. [Karla again - WOW - this stuff is fascinating - really. Be sure to go to Bob's link and follow it clear down the page - many, many segments and much information, and even some pictures of the covers. Last night, Hilda and I were eating some delicious watermelon while the temperature baked outside here in North Texas. I asked her if she remembered the watermelon stands in Houston. There was one at the intersection of Evergreen St. and Lawndale. An old dilapidated roofed building covered white painted tables with benches placed on a sawdust covered floor. One could pick out their watermelon either cold or hot. It turned into a Christmas tree lot during December. We lived at the corner of Evergreen and Mossrose and frequented this place in the summer and bought Christmas trees in the winter. Any other memories of watermelon stands out there? Seems like there was one on Telephone Rd. Charles, I remember that watermellon stand also. My family would make a special trip there on some hot evenings for a feast of ICE COLD MELON. You could just let the seeds fall to the floor/ground, as the sawdust would act as a sponge and was easily swept up and changed. 'Tis much like the peanut shells one finds at The Texas Roadhouse of today. My greatest memory of watermelon eating is sloshing through wash-tub-iced melons with juices dripping from my elbows and down my chin - in our big old backyard on Broadway or at family reunions at my grandparents' farm in Moscow (near Corrigan). We didn't have air conditioning at either place, so sitting outside in the sultry heat didn't feel all that bad. As far as memories of where we got them, I remember roadside stands on the way to or from somewhere outside Houston. The most memorable venue was the series of stands on the old Hempstead Highway, coming from or returning to Baylor. Of course, more recent memories involve trips to the grocery store and neatly cut slices that can be eaten at the dining table without making a mess. Precisely cut melon balls in a well-carved, fancy watermelon rind bowl even make it to the serving table at a refined luncheon at home or church. Nowadays we enjoy the seedless varieties - but that ain't REAL watermelon eatin'! "Hi, Karla - No, I'm not a Milby graduate. I lived on that side of town in Forest Oaks until I started 6th grade, and then we moved out to Cypress. Some of my neighbors from back then might have been in your class -- Jerry Jasper? Nelson Pruett? Bobbie Jean Graham? Anyway, I graduated from Cy-Fair in '68. I was actually googling for the Thunderbird drive-in on Old Galveston Road, and your blog was the only place I could find mention of it on the web. I'm in the middle of making a combination family cookbook/memory book - and while my mother wasn't a great cook, our picnics to Galveston and stops at the Thunderbird on the way back are some of my favorite memories. I was hoping to find a photo of the place, although I know the chances are very slim. I didn't mean to crash your blog, but I got so excited that someone else remembered the Thunderbird. I love your blog, by the way -- even though I didn't go to Milby, I have fond memories of some of the same places from back then. Cynthia"
Hi Karla, I am always interested in any contribution to the blog and I would welcome Cynthias visit and probing question as well. It bodes well for your creation that people can reach us through it and touch on our memories with their own as well as contribute to conversation. I would welcome most any enthusiastic participant with tales of the "GOOD OLE DAYS". Thanks Cynthia, I hope someone has a picture of the old " THUNDERBIRD " that Karla can install here, and you return regularly as I do ! You're the only one I've ever known that mentioned the name Moscow, TX. You said there was a family farm there. Moscow is in Polk County where Hilda grew up. Proceeding south on US-59 from Moscow you pass through Seven Oaks and then Leggett before reaching Livingston. All of Hilda's parents and relatives are buried in Leggett. Hilda grew up on a ranch right on US-59 just north of Livingston. You had to pass right by it on your way to Moscow. She lived in a large, rambling house to the left of the highway that had a big "H" on the chimney. That stood for Hogue. The Hogue's were all over Polk county. That's where Hilda acquired her unique Texas accent. I could listen to it for hours! Thanks for evoking wonderful memories. I was rummaging through the plethora in my PC Documents and noticed the following which I wrote prior to our having a Milby blog. Just a simple"Remembrance Of Things Past" but never to be forgotten. To my recollection, and my recollector is fuzzy now days, it snowed around Valentine’s Day in our senior year. The snow was sufficient to construct a Valentines heart ~ 4 foot tall. After rolling a number of snow balls across the yard I managed to stack them, fill in the voids and carve a recognizable heart. With exuberance I proceeded in having my true love come over. It was right at that moment my next door neighbor, John Danielson, came home and tackled the heart leaving nothing but a yard which now looked like a checker board with a lump. John was a great friend so we proceeded on having snow ball fights. As for the heart, easy come and easy go. My true love did come by and became the target of snow balls from John and me. John is now gone and I am the only person that saw the masterpiece. We all have memories that may soon be lost unless someday a blog will be printed capturing the thoughts of Milby 1960. Oh what a beautiful piece!!! My face - and my heart - broke out in a wide smile and sentimental tears came to my eyes as I pictured that long-ago time of youthful romance. What especially moved me was reading how quickly the romantic urge changed to pure boyish rough and tumble fun. Thanks for sharing this with us, Bob!! !